Pyin Oo Lwin is the former Maymyo a British hill station east of Mandalay in Shan State. The city is an excellent Myanmar antique shopping destination which is in the hand of Indian families who came with the British. This was the first destination the British built a railway to escape the summer heat of central Burma's Mandalay. At an altitude of 3539 ft (1078 m) above sea level it is very similar to Alpine regions. 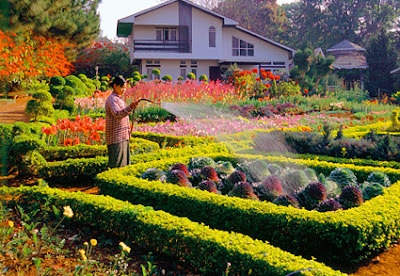 Here is Myanmar's best Botanical Garden (Kandawgyi). The town is so full of all kinds of flowers that it is call Pan Myo Daw (The Royal City of Flowers) in fondness and affection. The visitor will notice two significant things one is ivy-covered colonial buildings and colorfully painted closed wagons drawn by ponies and fixed with shiny brass lamps. The best known picturesque water falls are Dattaw Gyaink (Hollow of the Sacred Relic), Wetwun Falls and Pwegauk Falls or better known as B.E. Falls as it is near the Depot of the Burma Engineer Corps. The town has the atmosphere of a small British village with plenty of Indian and Pakistani shops and traders. 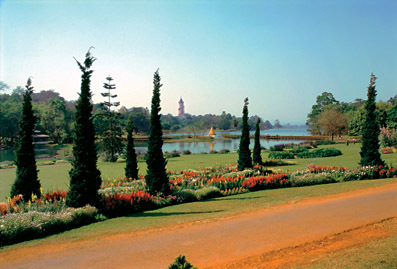 The old British houses with Chimneys and the botanical garden make this a unique tourist destination for locals and foreigners. A interesting sightseeing spot around Pyin Oo Lwin is Peikchin Myaung Grotto; Peikchin is a betel-vine like long pepper. The said cave or grotto nestles in a range of hilly terrain rediscovered in 1989, measuring 20 ft (6 m) at the opening and is about 1600 ft (488 m) deep. Stalactites hang down from the limestone ceiling and there are numerous springs converging to form a spring-fed stream, which flows through the grotto cascading down the boulders thereof. 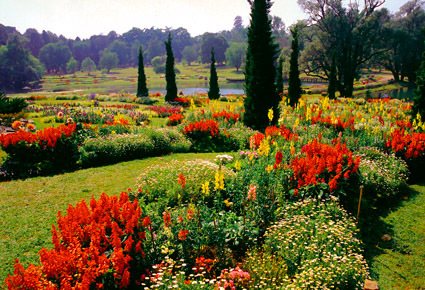 Pin Oo Lwin and Inle Lake are the most attractive destinations in Myanmar's Shan State with a "feel good" climate around one thousand meters altitude not far away from Thailand's Mae Hong Song. But cross-border travel is still very difficult because the Myanmar bureaucracy is still sticking in the 18 the century relating visa regulation.